The Email autoresponder allows you to send messages to your Amazon clients based on certain events. For example, you could send an E-Book to your client when their order has been shipped or delivered. First click on the “Email autoresponder” link in the menu on the left. Assuming you have setup your MWS access you will now see the Email Autoresponder control panel. The first time you access this page you will be asked to setup some basic settings that are required for the autoresponder to work. First set your Amazon Seller account email address. It is important that you use your actual email address of your Amazon Seller account, otherwise your messages will be denied by Amazon. This is because email autoresponder does not send emails directly to your clients. All messages go through the Amazon Messaging Service. Next you can set a default signature for the emails that will be sent out by your autoresponders. Just put your personal or company name there. Lastly you can enable the “Use Estimated Delivery Times for Unsupported Carriers” feature. Not all shipping carriers have a way of telling us if a package has been delivered. For those carriers we can estimate the delivery and send emails based of that. Now that you have completed this configuration you can start creating your first email-autoresponder. 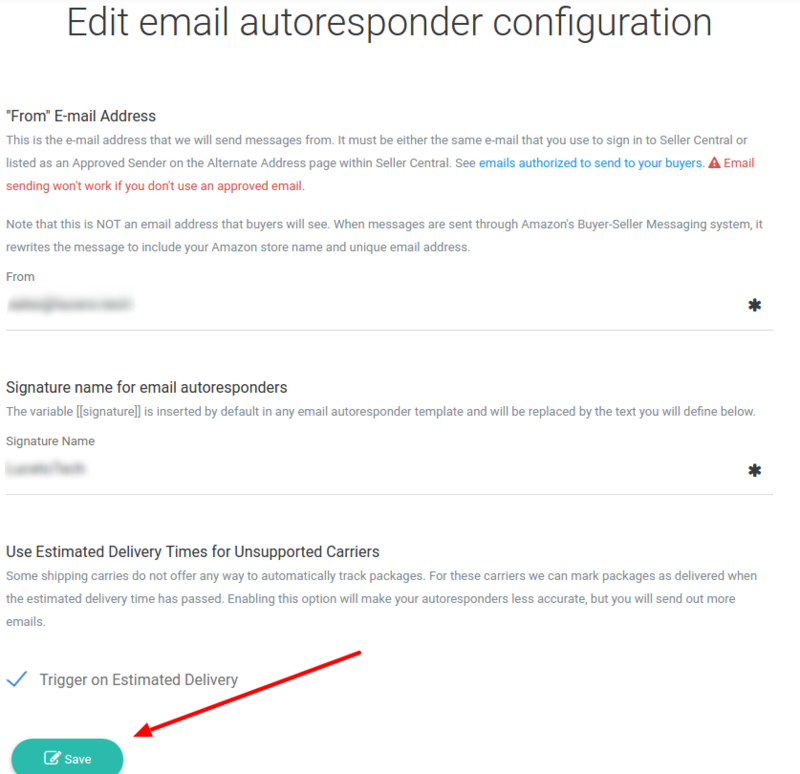 If you ever need to change the settings that you have just configured then simply go to the Email Autoresponder control panel and select the Configure option.